THE latest production by an amateur dramatic society has been rescued by a rather unusual saviour. The Wantage based The AmEgos group is staging The Rise and Fall of Little Voice next month, based on the 1992 Michael Caine film. But problems arose when one particular scene required an unorthodox prop, a cherry picker. Director Lesley Phillips wasn’t hopeful but thought she would ask plant and tool hire firm LJ & CA Cannings of Challow if she could borrow one. To her surprise, they said yes. Ms Phillips said: “It really was a shot in the dark, but we have no funding and rely on the goodwill of local people and businesses to help us. 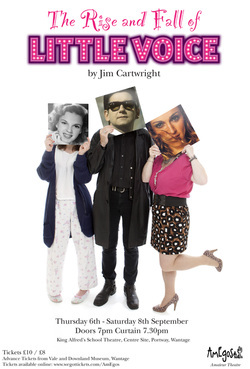 The Rise and Fall of Little Voice was written by Jim Cartwright and was first produced in 1992. It was adapted for screen in the film Little Voice that also starred Jane Horrocks and Ewan McGregor. All his training will hopefully pay off on the night when he pulls the levers to gently lower his co-star Grace Anderson from a first-floor window back down to earth. Miss Anderson, 22, is the real-life daughter of the director, and they will be playing Little Voice and her mother on stage in the production. An am dram group are using a cherry picker in their play. Grace Anderson plays Little Voice.